We’ve all seen the horror stories around how employees waste time at work. Talking or texting on mobile phones, visiting non-work related websites, and gossiping with co-workers are likely the three biggest culprits of subverting marketing productivity in the workplace, according to a Career Builder survey. But there’s another way your team could be wasting time, even if they’re not hanging out by the water cooler or sneaking in a game of Minecraft on company time. Focusing on the wrong marketing metrics is likely just as damaging as any of the productivity blockers mentioned above. After all, metrics help guide where a marketer spends the most time, and if you’re looking at the wrong KPIs, you’re focusing on the wrong things. When’s the last time you stepped back and took a good look at what your team is really working on? Are they spending their time trying to get more page views, likes or downloads? Or are they working toward improving your company’s bottom line? Earning the respect of the C-suite—not to mention earning a bigger slice of the company budget—means your team should be highly focused on revenue, ROI and company growth, while leaving those so-called vanity metrics behind. Are marketers wasting their workday? Unfortunately, with this division of time, there doesn’t seem to be much room for strategic activities. The survey also found that marketers are using seven different tools to measure marketing performance. With marketers logging in and out of so many systems, as well as trying to string disparate data together to generate insights, it’s no wonder they’re spending so much of their time trying to make sense of all the data being piled upon them. Marketing productivity can be heavily impacted by the switching costs of moving from tool to tool. One way to make your team more efficient is to gather all of your performance data together in one place. Not only will consolidating your marketing analytics save your team time, but with a unified view of activity across every channel, you can use marketing attribution to better link all of your customer interactions to activities that either open, close or influence a sale. Also, when you tie these activities to revenue, or other business growth KPIs, you can see just how much value each effort provides. Armed with these insights, you can better understand which activities are contributing to your bottom line, improve marketing productivity, and be sure your team is spending their time on initiatives that really make a difference to your company. 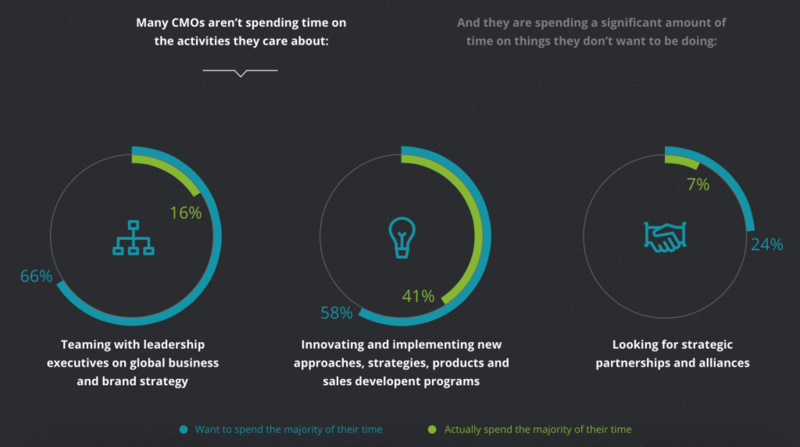 Speaking of time, it shouldn’t come as any surprise that CMOs prefer to spend time working with leadership on strategizing and innovation, rather than reviewing marketing budgets and campaigns. According to a study by the CMO Council, while only 16 percent of CMOs say they spend the majority of their time on strategizing, 45 percent say they spend most of their time reviewing and approving marketing plans, campaigns and budgets, with 42 percent spending much of their time in meetings. If CMOs want to dedicate more time to strategic initiatives, they’ll need to start thinking more strategically. This means making the shift to a revenue-driven model and ensuring that their teams are working with the right tools and metrics to drive success, and to ensure that improved marketing productivity increases business results. Unfortunately, notes the CMO.com study, only 23 percent of marketing leaders say their organization does “extremely well” or “quite well” in measuring and communicating the business value and financial contributions resulting from their campaigns and investments. To begin the revenue-driven transformation, you should start by reassessing your goals. Be sure that marketing goals are aligned to company goals so you have a good starting point to prove how your organization is contributing to business growth. Your goals should also focus on how your return on marketing investment (ROMI) ties back to your company’s overall return on investment. By calculating marketing ROI, or ROMI, you can understand how much revenue you earn for every dollar of marketing investment. The “I” at the end of the ROMI acronym is an important one. By viewing your marketing spend as an investment, rather than an expense, you take an important step toward revenue-driven marketing. Keep in mind that ROMI calculations will differ depending on the context in which you make the calculation. For example, if you’re looking at long-term numbers to inform planning and strategy, your results will differ from short-term calculations based on a specific campaign. It’s also important to agree on how you define costs and other variables. A lot of marketers struggle with how to link their ROMI to company ROI, as well as revenue and growth goals. The secret lies in looking at how every marketing activity contributes to those larger company goals. For example, rather than focusing on metrics that might make you look good, such as number of downloads or page views, you need to concentrate on metrics that tie directly to revenue, such as customer lifetime value (CLV), which allows you to get a handle on not only the costs associated with acquiring a new customer, but also how much you need to invest to nurture and grow existing customers. 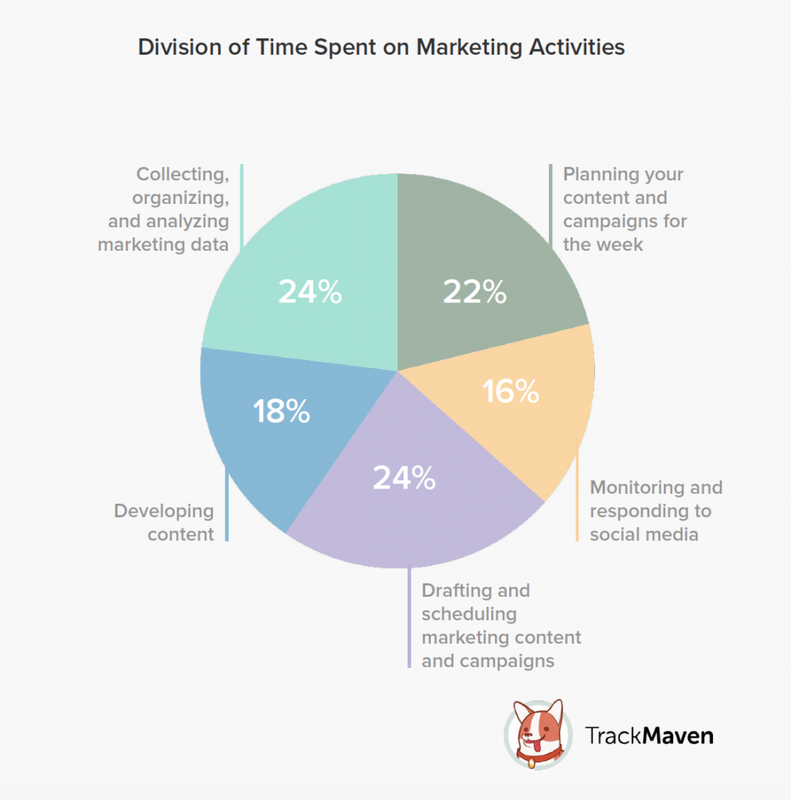 TrackMaven’s leadership survey uncovered some interesting findings related to marketing budgets—namely that 49 percent of marketers say their budgets have stayed the same over the past year, while only 36 percent noted an increase. This is significant because, although analysts predict a rise in 2017 budgets, many marketers are having a different experience. If this is the case for you, here are a few tips that might help you squeeze out some more funding for your own marketing initiatives. Besides speaking to fellow executives in a language they understand—which for the CEO, CFO and CTO means financial terms—to increase your chances for a bigger budget, you’ll also need to set expectations around time frames and returns. For example, many B2B companies don’t see immediate gains from campaign investment because buying cycles are typically longer. So, even if you invest in social media marketing, or other online marketing activities such as publishing content to your blog, you might not find out how those efforts contributed to a sale until several months later. As we all know, no one clicks on the Buy button just because they read one post on your site. Make sure stakeholders understand that these lags may occur, but keep them interested and encouraged along the way by showing how your short-term efforts are paying off. You can do this with the help of marketing analytics software like TrackMaven. Give executives access to a dashboard that lets them see how much each post in your latest social media campaign is worth, as well view reports of social or content ROI over time. Once they see all of the touchpoints that contribute to a sale in one place, they’ll better understand expectations around returns and marketing productivity. And with constant exposure to how marketing is linked with revenue, they’ll, too, make the switch from thinking about marketing as a series of expenses, to truly understanding the value that marketing contributes to the success of the company. To find out about more about how executives improve marketing productivity, download your free copy of the 2017 Marketing Leadership Survey today. Do You Have What It Takes to Be a Marketing Executive?